Toyota City, Japan, June 25, 2014―Toyota Motor Corporation has revealed the exterior design and Japan pricing of its hydrogen fuel cell sedan, first unveiled as a concept at the Tokyo Motor Show last year. In Japan, the fuel cell sedan will go on sale at Toyota and Toyopet dealerships, priced at approximately 7 million yen (MSRP; excludes consumption tax). Initially, sales will be limited to regions1 where hydrogen refueling infrastructure is being developed. U.S. and Europe prices have not yet been decided. Likewise, more detailed information, such as specifications, exact prices and sales targets, will be announced later. Toyota’s commitment to environment-friendly vehicles is based on three basic principles: embracing diverse energy sources; developing efficient, low-emission vehicles; and driving real and positive environmental change by popularizing these vehicles. Hydrogen is a particularly promising alternative fuel since it can be produced using a wide variety of primary energy sources, including solar and wind power. When compressed, it has a higher energy density than batteries and is easier to store and transport. In addition to its potential as a fuel for home and automotive use, hydrogen could be used in a wide range of applications, including large-scale power generation. Toyota has been developing fuel cell vehicles in-house for more than 20 years. 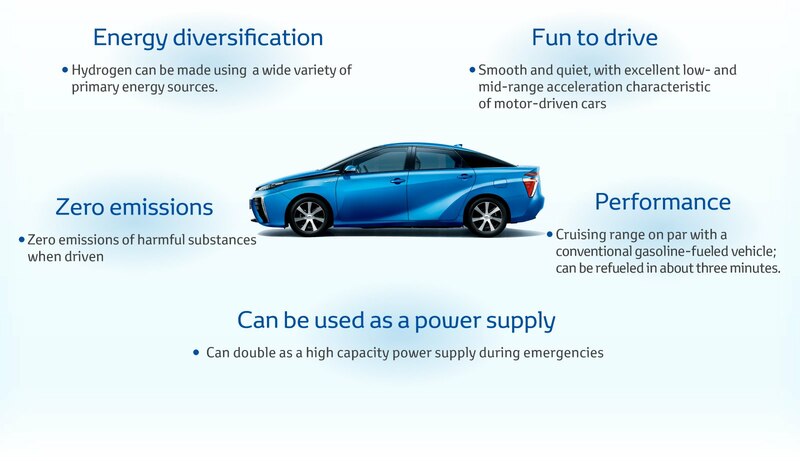 Toyota’s fuel cell system includes a proprietary FC Stack, which generates electricity from the chemical reaction between hydrogen and oxygen, and high-pressure hydrogen tanks. In 2002, Toyota began leasing the “Toyota FCHV”, a fuel cell SUV, on a limited basis in Japan and the U.S. Significant improvements have been made to the FC system since 2002. The fuel cell sedan Toyota revealed today, for example, features performance similar to a gasoline engine vehicle, with a cruising range2 of approximately 700 km (according to Toyota measurements taken under the Japanese Ministry of Land, Infrastructure, Transport and Tourism’s JC08 test cycle) and a refueling time of roughly three minutes. When driven, it emits only the water vapor produced by the reaction between hydrogen and oxygen. Toyota Group3 companies are also engaging in other hydrogen-related initiatives, such as developing and testing fuel cells for use in homes, and developing fuel cell forklifts and fuel cell buses. It is a car that is equipped with make electricity by causing a chemical reaction of hydrogen and oxygen a "fuel cell", run by a motor. Hydrogen as a fuel alternative to gasoline, energy that can be environmentally friendly, made ​​from a variety of raw materials. In addition, the development of the vehicle, we have applied as a core technology of Toyota hybrid technology has cultivated. As car ideal towards "sustainable mobility" implementation, the aim of the early dissemination, for the first time in the world, such as limited sales in Japan and the United States to "Toyota FCHV" from 2002, Toyota, of fuel cell vehicles We have created a strong track record in development. One step closer to practical use "Toyota FCHV"
The "Toyota FCHV-adv" was released on 2008 could run 330km of one hydrogen filling. New FCV has improved to run about 830km. In addition, cold start traveling in cold climates of minus 30 ℃ also becomes possible, it has achieved practical driving performance with no trouble. The only body sedan, 70MPa and (FC stack) new fuel cell developed in-house was smaller and lighter * 1 It is a high efficiency package that was placed under the floor, the two high-pressure hydrogen tank. The hydrogen energy density is high, because it does not become an extreme increase in cost as EV even increase the amount of the tank for the range ensured, even with the same zero emissions here for FCV large benefits to more than a certain distance will. By removing the humidifier from the FC system, improved reliability, achieving a smaller and lighter. Reduction FC cell number by adopting a step-up converter, and achieves size reduction motor, making it the package efficiency. About 700km cruising range (JC08 mode Toyota measured). The hydrogen filling is fully filling a short of gasoline and a per 3 minutes. With regard to hydrogen use, as well as FCV, we are promoting the development by increasing the Toyota Group. It has been the development of FC bus and Hino Motors, with the aim of market introduction of the 2016, one is accelerating the development. In addition, and efforts to fuel cell for home use, we are available from April 2012, the the world's highest level of 46.5% power generation efficiency. And developing a forklift FC in Toyota Industries Corporation, from December 2012, and conduct demonstration tests in Kitakyushu factory Toyota synthesis. The Toyota Tsusho, we are considering the development of hydrogen filling a small device on the assumption that hydrogen filling of the dealer.